Typoman: Revised is a clever little creation by Brainseed Factory. When the game was originally launched late last year, it left a lot to be desired, but this year’s revision is largely an improvement in terms of graphics, sound design, and mechanics. Aside from some of the set pieces, most of the creatures and objects in this game are built out of letters. You play as the HERO, traveling through different post-apocalyptic environments and crafting words that solve puzzles or scare away the darkness. 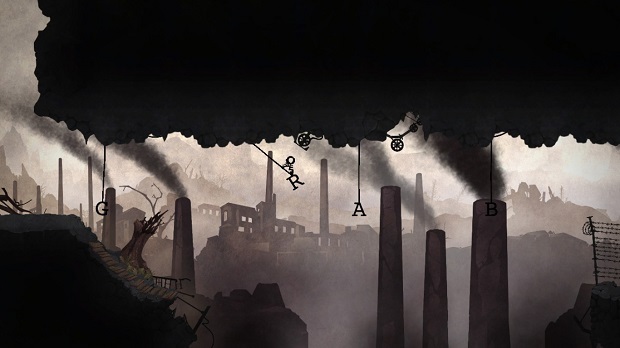 The world of Typoman: Revised is intriguing and atmospheric. Each area feels distinct, and an understated but noticeable soundscape adds to the experience. This game features wordplay and platforming, striking a pretty even balance between the two. The platforming sections are smooth, and most of the time it’s easy to predict where your jumps will land or if you’ll be able to cling onto a ledge. Much of it comes down to timing, whether you’re skipping across crumbling rocks or outrunning a raging fire. Completing word scrambles – arranging letters into positive or actionable words that help you progress through chapters – is never too difficult. They’re just challenging enough to feel rewarding when you form that magic word, and often there are multiple solutions. Unlike the first version, it was never a struggle spotting letters to use against the background, but the controls for moving around letters did take some getting used to. When it comes to the story, there still isn’t much that’s overt. I did like the subtle narrative of censorship and the power of words told through the surroundings and quotations that can be discovered. These elements give you something to ponder in between monster chases and poison puzzles. While the quotes aren’t by anyone in particular, they are brief thoughts that let you pause and contemplate themes like wisdom vs. propaganda and good vs. evil. However, the ending fell flat for me. The game built up plenty of tension through all of your encounters with forces of negativity – word monsters like DOOM and FEAR following you around – but then it tried to go in too many directions to resolve that tension. It felt like three or four endings back-to-back instead of one clear ending, so the final moments were conceptually confusing and whiplash-inducing. Overall I enjoyed Typoman: Revised, but it wasn’t quite as thought-provoking or awe-inspiring as I’d hoped. You can tell that it’s been polished from the first version, but the story is still too vague to leave much of an impact. It was a short experience; my playthrough was just over four hours, and that was taking my time on puzzles and seeking out quotations. I can’t help but think that additional cutscenes, further quotations, and a more focused ending would’ve made this game feel fully realized. Typoman: Revised is definitely a step up from the original iteration. It has more of its own style, and the gameplay mechanics rarely feel clunky. Though it hints at a meaningful narrative, ultimately it isn’t very substantial.